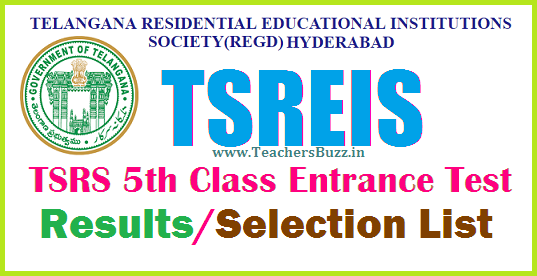 TSRS means Telangana Residential Educational Institutions Society(Regd),Hyderabad,TSRS 5th class Admission Test Results 2017 |TS Residential schools V Class Admission Test Results 2017,TSRS results tsrjdc.cgg.gov.in, Telangana Residential 5th Class Admission Test 2017,TSRS 5th Class Entrance Test 2017 Results. TSREIS Telangana State Educational Institutions Society has issued TSRS 5th Class Admission Test 2017 Notification in February 2017 and this entrance test for admissions into 5th class in Telangana Residential Schools in the Telangana State for the academic year 2017-18.The online applications areinvited from the Class IV bonafide students for admission into V class in its TSR Schools and this admission test was conducted at all district head quarters. TSREIS officials released the TSRS 5th class Admission Test Results on 18-05-2017and the results are now available its web portal: tsrjdc.cgg.gov.in Candidates can check their results given in the following link.